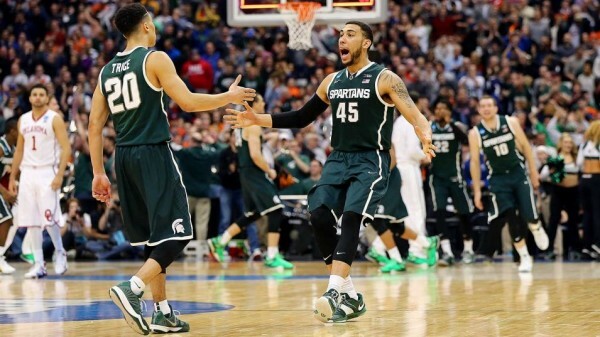 Michigan State did the little things down stretch – which isn’t always the case. Michigan State entered tonight’s contest ranked 339th nationally in free throw percentage (63%). Against Minnesota on February 26, the Spartans missed several key shots from the stripe, committed a number of silly fouls and blew a five-point lead with less than 20 seconds remaining. They nearly did the same thing at Indiana two weeks later. Late-game execution hasn’t exactly been their forte. But tonight was different. Branden Dawson and Matt Costello ripped down several huge offensive rebounds when Tom Izzo’s club needed them most. No one committed bone-headed fouls or careless turnovers. And despite going just 9-of-16 from the stripe as a team, Travis Trice and Denzel Valentine hit six free throws in a row in the game’s final two minutes to seal Michigan State’s four-point victory. Travis Trice carried the load (again); Denzel Valentine stepped up. After scoring 15 points against #10 Georgia and 23 points against #2 Virginia – including a late, dagger triple – senior guard Travis Trice once again carried the offensive load for Michigan State, pouring in 24 points on 50 percent shooting and knocking down several huge free throws down the stretch. Meanwhile, forward Denzel Valentine – who mustered just four points against the Cavaliers – finally woke up in the second half, scoring 13 of his 18 points in the final 20 minutes and keeping the Spartans on top late. Oklahoma went cold. Izzo said of Oklahoma, “They gave it to us in every way it could be gotten” early on. And he’s right. For the first eight-plus minutes of the game, the Sooners blasted Michigan State on both ends of the court, using a flurry of layups and dunks to jump out by a score of 18-8 before the Spartans even knew what hit them. Then, the offensive melee came to a halt. Dawson, Costello and the rest of Izzo’s frontcourt shored up the interior, and Oklahoma shot just 4-of-17 from behind the arc (including Buddy Hield’s 3-of-10 3FG). The Spartans weren’t exactly scorching the nets, either, but their offensive surge to start and end the second half proved enough to win. Star Player: Travis Trice (24 points, 6-for-6 FT). Valentine was awesome, but Trice’s consistent scoring and four clutch free throws toward the end of the game stood out from the rest. The senior has now scored 20 or more points in five of the Spartans’ last eight games. They’ll need more where that came from on Sunday against defensively-tough Louisville. Quotable: “I should thank Kevin Ollie…he’s given me a little bit of light at the end of the tunnel, the way they came in and waxed us.” – Michigan State head coach Tom Izzo, referring to his team’s loss to #7 seed Connecticut in last season’s Elite Eight. This year’s Spartans – also a #7 seed – hope to find similar success on Sunday as the Huskies did last March. Sights and Sounds: Midway through the second half, CBS announcer Verne Lundquist was nearly taken out by Oklahoma’s Buddy Hield. Despite narrowly avoiding disaster, the legendary play-by-play man seemed to be enjoying every second of it. What’s next? Izzo and the Spartans will take on Louisville for a chance to play in the Final Four. In 2009, #2 seed Michigan State beat the #1 seed Cardinals in the Elite Eight; in 2012, Rick Pitino’s #4 seeded bunch beat Michigan State, the top seed in the West, in the Sweet Sixteen. This entry was posted on Saturday, March 28th, 2015 at 12:22 am by Tommy Lemoine	and is filed under 2015 ncaa tournament, rushed reactions. Tagged: big ten, east region, feature, lon kruger, louisville, michigan state, ncaa tournament, oklahoma, rick pitino, tom izzo. You can follow any responses to this entry through the RSS 2.0 feed. You can leave a response, or trackback from your own site.